Sharon pulled out the big guns and decided to make the fanciest dessert that has graced the Cooking Club scene to date. Well, they’ve all been amazing, so maybe that’s not a fair statement, but this was as delicious as it was beautiful, that’s for sure. 1. Combine 3/4 water, sugar, corn syrup, and pinch of salt in large saucepan. Bring to boil over medium heat, stirring until sugar dissolves. 2. Add pear pieces and simmer until pears are very tender, stirring occasionally, 8 to 10 minutes. Cool slightly. Transfer mixture to food processor and puree until smooth. Chill pear mixture until cold, about 2 hours. 3. Process pear mixture in ice cream maker according to manufacturer’s instructions. Transfer pear sorbet to freezer container; cover and freeze until firm. Do ahead of time — at least 24 hours and up to about 3 days ahead of time. 1. Pour sake into 8x8x2-inch glass dish. 2. Spoon 2 tablespoons water into heatproof custard cup, ramekin or small bowl. Sprinkle gelatin over. Let stand until gelatin softens, about 10 minutes. 3. Pour enough water into small skillet to come 1 inch up sides; bring to boil. Reduce heat to very low. Place cup with gelatin mixture in hot water in skillet. Stir until gelatin dissolves and mixture is fluid, about 1 minute. 4. Remove cup with gelatin mixture from skillet. Pour gelatin mixture into sake and stir to blend well. Freeze sake mixture until firm, at least 8 hours or overnight. 1. Combine 1 1/2 c. water and 1 1/2 c. sugar in medium saucepan. Bring to boil, stirring until sugar dissolves. Remove from heat. Cool simple syrup until just warm to touch, 20 to 30 minutes. 2. Meanwhile, cut off peel and white pith from all grapefruit. Working over bowl to catch juices and using small sharp knife, cut between membranes to release segments into bowl. Quarter and core Asian pears, then cut lengthwise into very thin slices. Add to bowl with grapefruit. 3. Pour warm simple syrup over fruit. Cover and refrigerate until well chilled, about 2 hours. Make sure to do this ahead of time and not at the last minute — can be done up to six hours ahead of time. 4. Arrange 1 layer of pear slices in each of 6 cocktail glasses. Top each with 1 layer of grapefruit segments. Spoon 2 tablespoons syrup from fruit mixture over. Scrape fork all over sake granita to form crystals. Place large spoonful of granita atop fruit in each glass. 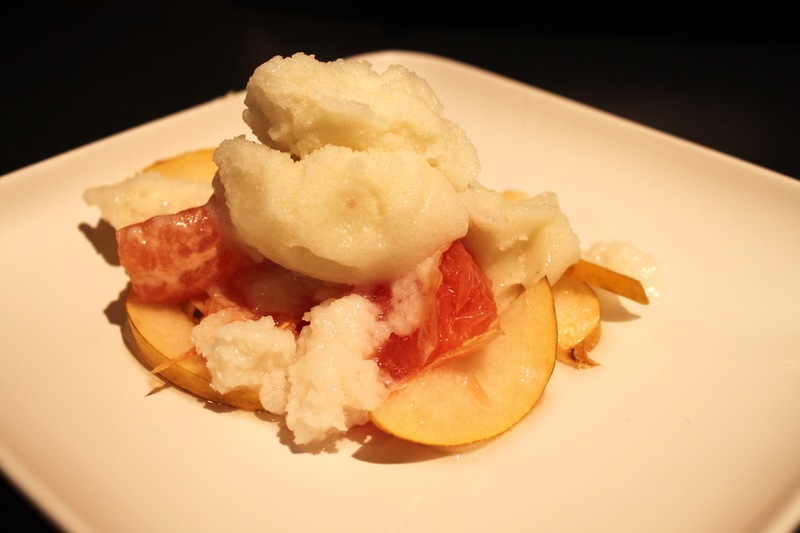 Top each with 1 more layer of pear slices, then layer of grapefruit segments and scoop of pear sorbet. Garnish with fennel fronds, if desired, and serve. Entry filed under: cooking club, Dessert, Recipes, Uncategorized. Tags: asian dessert, grapefruit, ice cream, ice cream maker, pear, pear sorbet, sake, sake granita.